I can’t remember how many times I’ve joined a gym or an aerobics program only to quit an embarrassingly short time after joining. I blame it on my own will power, of course. But listening to Shelley Lowther, a former real estate professional with an evangelistic zeal for yoga, I see how many body movement programs aren’t designed for me. Maybe I need people, not buildings, machines or even instructors. A caring community. That’s what Lowther says sets Dancing Dogs Yoga apart and leads to this poll’s result. Dancing Dogs Yoga uses a practice called Baptiste Yoga, founded in the 1940’s and described as a tool for personal transformation. It involves heat and sweat. It involves more physical challenge and the need for an open mind and a commitment to growth. “We meet you where you are,” Lowther says. “You can come in from a gymnastics background and you’re doing handstands as you walk in the door. Or you can come in not able to touch your toes and we can work with you.” They have softer classes! Other aspects of Baptiste Yoga include focus, breath and flow. But Lowther comes back time and again to non-physical ideas like empowerment and possibility. “We try to teach every single posture from that perspective,” she says. Her own personal transformation with this yoga concept led her to open her first yoga studio in 2010. “It’s something that helped me in my stressful life,” she says. And she wanted to share it. Dancing Dogs Yoga is now in five cities. 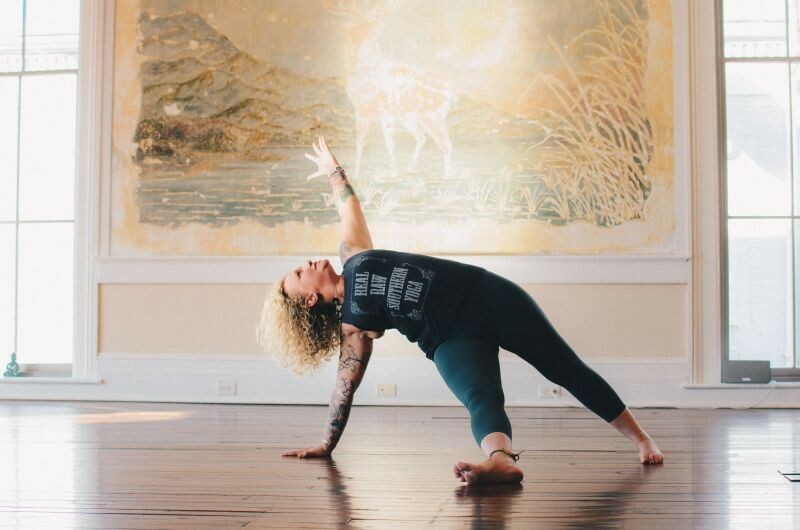 In addition to the Broughton Street studio, with about 20 instructors, there are Tybee Island, Atlanta, Bluffton and Greensboro locations. And they’re expanding again. Soon, the downtown space will add Reiki, massage, sound and acupuncture healers.